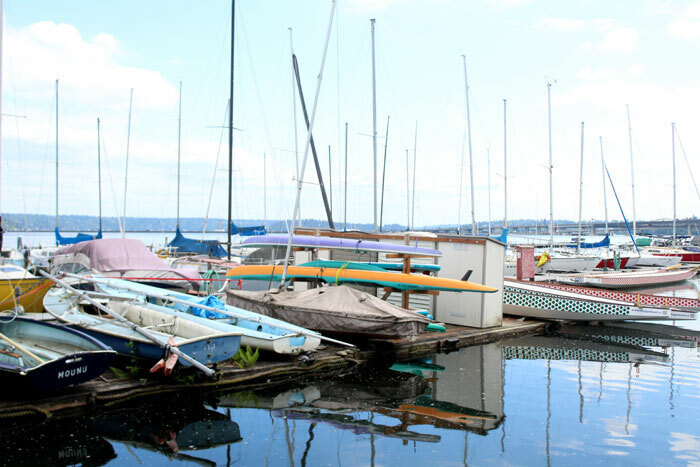 Photo by Brandon Macz: A tentative agreement with Friends of Lakewood Moorage will clear legal hurdles to upgrading the South Leschi marina, but a permit delay means construction still likely won't happen until 2020. 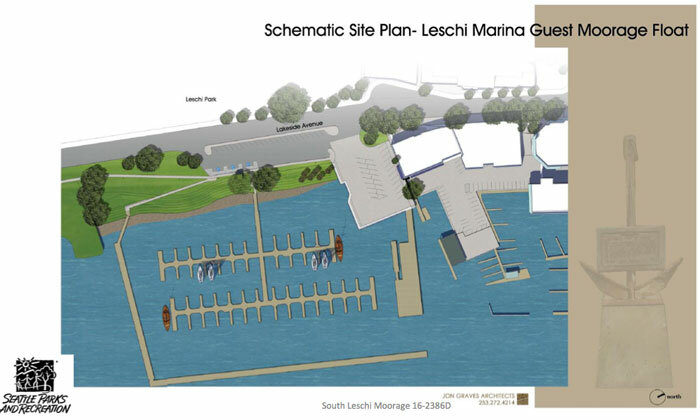 Seattle Parks and Recreation is also working on designs for floating guest moorage at South Leschi. Marina Management and the City of Seattle have reached a tentative settlement with the Friends of Lakewood Moorage that is expected to partially clear the way for upgrading three marinas along Lake Washington. Amid protests from residents who use the current facilities, the city council in August 2017 approved Seattle Parks and Recreation entering a long-term lease agreement — at least 20 years — with Marina Management to maintain, operate and improve public access to the North Leschi, South Leschi and Lakewood Moorage public marinas. The private operator took over management of Seattle’s marinas in January 2018. Friends of Lakewood Moorage filed a motion for summary judgment in King County Superior Court, arguing the city failed to hold a public hearing — as required under Initiative 42 — before approving the lease. The court decided in favor of the city and Marina Management last April, but Friends of Lakewood Moorage president and attorney Jeannie O’Brien appealed. Part of the group’s challenge was that larger slips would be added at the Lakewood Moorage, pushing out longtime tenants for large private luxury ships. The settlement will maintain the “small, quaint character of Lakewood Marina,” O’Brien said, “how it had been since it began in 1953.” There is still language in the settlement agreement that needs to be revised before it’s signed, she said. Under the settlement agreement, larger slips at Lakewood Moorage are being removed from designs, which means more slips will be created, but all around 30 feet or less, Jones said. Initial plans were to remove 38 small slips, for boats 30 feet and smaller. All 12 of the 20 foot slips, 16 of the 24 foot slips and 10 of the 30 foot slips. A big change to the neighborhood, the public shoreline and the marina. Seven 50-foot slips would have been added, plus one 54-foot slip, two 35-foot slips and a 96-foot slip, none of which are current options at Lakewood. There are also developing plans for community events that draw in people who don’t own boats, Jones said, such as fishing derbies for kids. Plans had always been to address the more dilapidated South Leschi moorage first, but the contract Friends of Lakewood Moorage was challenging included all three marinas. Even with the issues caused by Friends of Lakewood Moorage mostly settled, Jones said, the permitting process with the U.S. Army Corps of Engineers necessary to conduct work in Lake Washington will likely delay construction until 2020. Three separate permits were filed last year, but a backlog in the Northwestern Division of the Corps of Engineers was exacerbated by the month-long federal government shutdown, Jones said. There is the potential another shutdown will occur next week, if President Donald Trump does not receive funding for his border wall. Seattle Parks and Recreation is also working on its design for an L-shaped guest moorage and public access improvements at the South Leschi marina, which is being funded by a $1 million Washington State Recreation and Conservation Office grant that the city is matching with $1.52 million. The new entry point will be ADA compliant and connect to new moorage floats on the north and east sides of the basin. There are only 237 transient moorage slips on Lake Washington, and none of those are in Seattle. The project will provide 53 side ties across an 810-linear-foot floating dock, according to SPR’s grant presentation, which states 87 percent of Lake Washington boaters surveyed said they would use transient moorage if available. Fifty-eight percent of respondents said they wanted access to upland amenities. SPR expects the guest moorage to also benefit boaters from South Seattle. Once complete, the guest float will be one of only two overnight options on Lake Washington.